This Week on Hobo's Lullaby: Jefferson Hamer and Eamon O'Leary of The Murphy Beds! Tune in this Saturday the 13th from 4-6pm and nurture your Irish roots with a live set featuring The Murphy Beds as they get ready to release their new album! 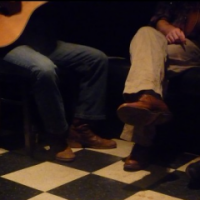 This duo features local favorite Jefferson Hamer with his blend of superb guitar-playing, vocals, and songwriting, and Dublin born singer and bouzouki-player Eamon O'Leary!